604, Jalan 17/12, 46400 Petaling Jaya, Selangor, Malaysia. Established in Singapore in 1973, T.I.P. is today a household name in a comprehensive range of tapes widely used in homes, offices, hospitals, and every kind of industry. To meet the growing and diverse needs of the market, from the most commonly-used tapes to the highly specialised tapes, T.I.P. has, over the years, invested heavily in modern and sophisticated machineries. This enables us to supply the precise specifications of tapes that are required by today's high-tech industries. T.I.P. 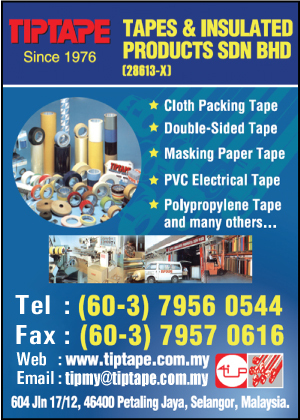 headquarters in Singapore works closely with its branches in Malaysia and Thailand to market tapes in the Asia Pacific region. Our ever-growing customer base includes users from light and heavy industries like general packaging, electronics, lithographic services, textile manufacturing, engineering and construction. Our investment in manpower training and office automation has also increased substantially over the years, making it possible for our customers to enjoy attentive and prompt service every time. With our highly-trained sales and technical personnel always on hand to lend their expertise, you can be sure there is a tape that meets your special needs! The next time you shop for self-adhesive tapes, ask for T.I.P. by name. We have the efficiency and reliability that you can trust.